Dan Bennett and his son, Dan Bennett Jr., are cofounders of Izsam, an innovative cleaning company. With a combination of experience equaling to 50 years in the industry of commercial cleaning services, they created their company in 1998. Focusing on cleaning construction sites and zones, their company saw rapid growth in its home of Omaha, Nebraska. A reputation for exceptional work developed quickly for their company so it began to offer a range of services to clean and this led them to securing business with a large variety of industrial, commercial, construction, and residential clientele. Izsam’s client base rapidly expanded past Omaha to cities like Dallas, Kansas City, Phoenix, Denver, and more. Together, the tag-team Bennett father-and-son combination established a company with over 400 clients and eventually gained the trust of a few of the biggest industrial, construction, and commercial clients in the United States. Because of this wild success, the company now provides cleaning assistance to a vast group of hospitals, apartments, hotels, office complexes, and more. Without letting their success create complacency, the company still focuses on every single detail of safety in the workplace and using cleaning supplies that are environment-friendly and green. Known for pricing competitively, Izsam stands prepared to ethically and efficiently clean any size of construction site. Izsam is known for their construction final-clean expertise and other services. Because of their ethics and efficiency for construction cleanup, they hold a top spot in their unique niche in a rapidly-expanding cleaning service industry. Call Izsam to see how their company can fulfill your pre- and post-construction site cleaning needs. 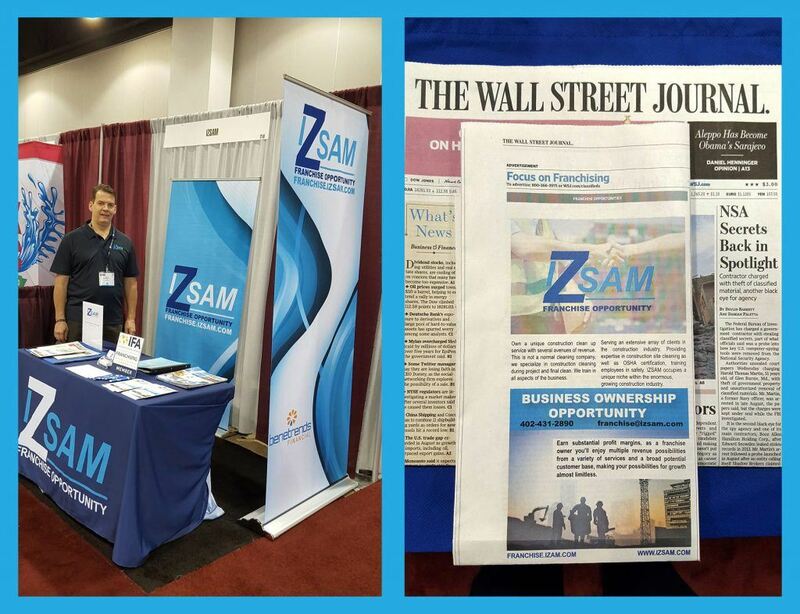 Izsam traveled to a trade show in Denver in October to promote the franchise opportunity. We also got some press in the Wall Street Journal! A good month for getting out the word on what IZsam is all about!